Beijing based artist Wang Gongxin and Arrow Factory are pleased to present It’s Not About the Neighbors, a video installation that engages with the immediate visual and social context of Arrow Factory’s hutong alley location. Replicating the façade of the adjacent pancake shop and projecting video during nighttime hours, Wang creates an eerie sensation that fluctuates between alternate states of absence and presence, image and reality, day and night. During the day, It’s Not About the Neighbors is a sculptural installation, an uncanny imitation of the neighboring pancake shop’s façade—a simple aluminum and glass storefront commonly found in Beijing’s older neighborhoods. At nightfall, a video projection on the façade depicts the neighbors at work making and selling their bread and noodles. The work’s relationship to the adjacent business changes depending hour of the day; at times it is a physical imitation, at times it is a virtual simulation, and sometimes it’s both. The overriding visual connection between these two adjacent spaces is undermined by their different functions: one is an operating business that depends on local residents and neighbors for its income; the other is independent and non-functional, relying instead upon the visual economies of the hutong and patterns of everyday life. 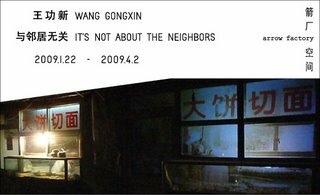 The dual meaning of the word “neighbors,” proposed by Wang’s installation refers to both those who occupy the adjacent shop as well as those who frequent the shop for their daily meals. Offering an indexical relationship to its own location It’s Not About the Neighbors also uncovers new questions about presenting contemporary art in public contexts. Wang Gongxin (b.1960) is an internationally recognized artist specializing in video and video installations. His practice centers on conceptions of reality and imagination as represented across cultural, economic and historical divides. Moving to New York City in 1987, Wang’s work contained a strong element of self-exploration, and upon his return in the mid-1990s took on a renewed perspective on China’s social and economic transformation. He was a key force in what is known as Apartment Art in the mid-1990s and other pioneering art groups in China. Based in Beijing, Wang is a guest professor in the New Media Art Department at the Central Academy of Fine Arts, Beijing. if you're in the area, feel free to swing by. the projection gets turned on after dark.